Welcome to Brown Dog Ink, where stories are told visually to celebrate and bring out the best of a memory, convey information and help you celebrate your life. 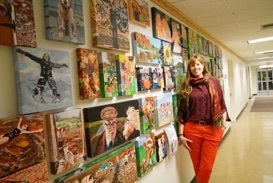 Award winning artist, Susan J. York brings her 20+ years of varied professional art experience to your project to create a family heirloom in the form of a painting or perhaps a mural for your family to grow with, a logo for your business, graphic design services or Educational/Environmental Graphics. Whatever your artistic need, Brown Dog Ink strives to bring beauty and originality to your story. Susan J. York brings her 20+ years of varied professional art experience to your project to create a family heirloom in the form of a painting or perhaps a mural for your family to grow with, a logo for your business, graphic design services or Educational/Environmental Graphics. Whatever your artistic need, Brown Dog Ink strives to bring beauty and originality to your story. Painting subject matter may be accessed below by clicking on the various images or navigated to using by the links at the top of the page. All images used in this site © Susan J. York, Brown Dog Ink. Gathering Goodness Mosaic 5’ x 34’. Health Alliance Hospital Mary’s Ave Campus, Kingston, NY installation day. 108 Paintings inspired by patrons ideas on Peace, Love and Joy.